Somehow it is Fall…of 2015! How exactly has this happened? The good news is that this means it is time for another installment in the Holidays with Jane collection! This time we are celebrating Halloween! The ebook is currently for sale on Amazon and the paperback is coming soon. Here’s the list of stories, I have Pride and Prejudice with time, which was both fun and daunting ‘cause it’s P&P and basically perfect and everyone loves it! Load up on pumpkin spice, grab your bowl of candy, and settle in for a spooky night with six brand-new modern Jane Austen adaptations from the authors of Holidays with Jane: Christmas Cheer and Spring Fever! Eight years ago Anne Elliot made a devastating choice. When a new threat and an old love both come into her life, she faces that choice again. This time will it be love or will it be magic? Catie Morland isn’t sure how to explain what happened at Abbey College’s annual Fall-o-Ween event until bumping into vacationing sisters Jane and Cassie. Will everything begin to make sense as she tells them the whole story? Miriam Dashwood has to throw a party for straight-laced Brandon Firestone without spending a dime. When the lead for rock sensation Willow Bee offers a free performance, Miriam figures he’s her hero. Brandon has other ideas, but will free spirited Miriam come around to his way of thinking? Emma Woodhouse is determined that this year’s Fall Ball will be the most successful one yet. An influx of single men in Highbury make a Bachelor Auction a reality. Can she work her matchmaking magic once again? An impromptu Halloween party at Mansfield Park Boarding House provides Pug an opportunity to use his magic powers to unite Pryce and Spenser. But can he expose their true feelings for each other before his powers fade? Halloween isn’t what Will Harper planned. His sister is playing fairy godmother. He’s at Chawton High’s Trick or Sweet Dance. He’s in costume…and falling for Elena Marquez? Is it real or magic…and can it last Beyond Midnight? 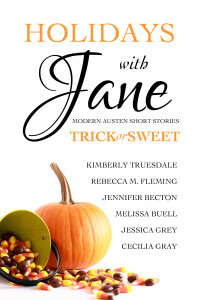 To promote Holidays with Jane: Trick or Sweet, the lovely Melissa Buell has set up a fantastic blog hop. The start post is over on Indie Jane and there will be posts from all of these fantastic authors (and slightly less fantastic me) along the way, as well as a giveaway.